Our partner school Habla Ya is located in the heart of Boquete on the main street with many restaurants, cafes and shops in the immediate vicinity. The school has 17 classrooms, a student lounge and there is Wi-Fi available. Our partner school HablaYa is located in the heart of Boquete on the main street with many restaurants, cafes and shops in the immediate vicinity. The school has 17 classrooms, a student lounge and there is Wi-Fi available. In cooperation with travel agencies the school organizes a wide range of activities and excursions, allowing you to discover the beautiful surroundings even better. You can, for example take a zip-line ride through the jungle and then comfortably relax in the hot springs. As well while rafting, rock climbing, horseback riding or hiking on the volcano Baru you get to know the beautiful surroundings. Of course, the school also offers less intensive activities like movie nights, joint meals, salsa and yoga classes and extra conversation classes. In this course you will learn Spanish very intensively in small groups of up to 6 people. You have 20 hours of classes per week. Before arrival, you will participate via Internet in a placement test. Yet your oral skills will be tested on site and you will be assigned to the group with the corresponding level. Beginners always will attend a beginners group. A double room can only be booked by 2 persons travelling together. The mentioned price is for an airport transfer/transfer from the bus station in David. With arrival before 8 am and after 5.30 pm a supplement of € 10 is charged. If you travel via Panama City: 1 night at a hotel at Panama City: € 70 p.p. Airport transfer up on arrival to the hotel in Panama City: € 42 p.p. Transfer from Panama City to Boquete can be arranged, contact us for more information and prices. The school is closed on 01/01/2019, 09/01/2019, 04/03/2019, 05/03/2019, 19/04/2019, 01/05/2019, 03/11/2019, 04/11/2019, 05/11/2019, 28/11/2019, 08/12/2019, 25/12/2019. Missed lessons during these days will be rescheduled on Saturday morning. In this course you will learn Spanish very intensively in small groups of up to 6 people. You have 20 lessons per week. Before arrival, you will participate in a placement test via Internet. Yet your oral skills will be tested on site and you will be assigned to the group with the corresponding level. Beginners always will attend a beginners group. The mini-group course of 20 lessons per week is supplemented by a private lesson each day. These private lessons are designed according to your personal wishes: from everyday conversations to professional usage. Living with a host family is a perfect opportunity to get to know the everyday life in Panama. You will stay in a single room with the options of breakfast, half or full board. All host families live within a maximum of 20 walking minutes from the language school. Considering the international atmosphere in Bocas del Toro, the accommodation in a host family is a fantastic opportunity to practice your Spanish in real-life situations. The guest house is a small establishment with a total of 7 rooms, a garden with a small pool and a terrace where you can have breakfast (not included). The accommodation takes place in single rooms with private bathroom and self catering. Double rooms can only be booked by two people who are traveling together. 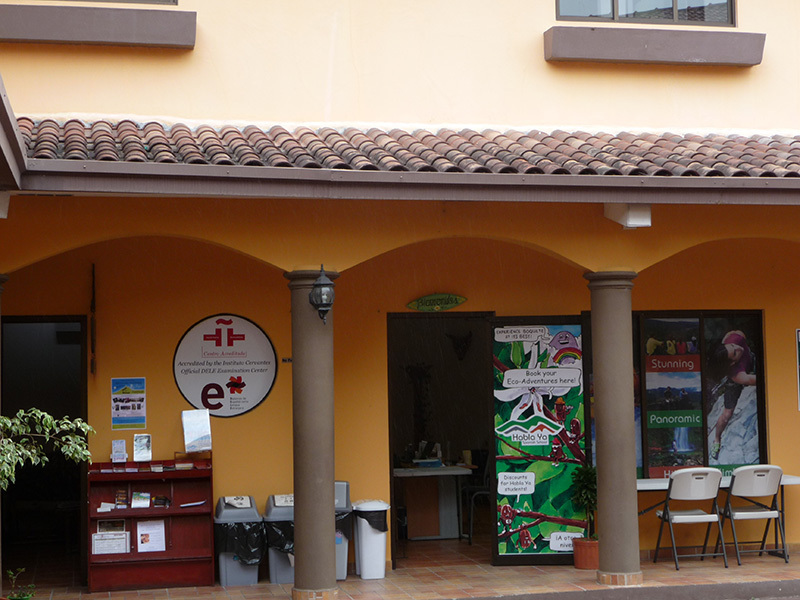 The pension is situated about 5 minutes walk from the center and the language school.